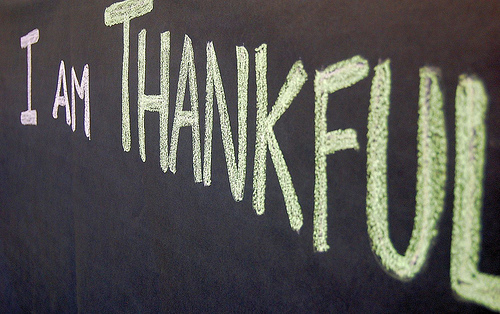 The month of November is always a time when we remind ourselves what we are thankful for. In business it may be a strong loyal client base, an awesome team of people who support us, a contract win, or even the fact that we enjoy doing what we do. For personal gratitude, it may be our family, our friends, or even the barista who makes our morning coffee exactly to our liking every time we stop in. Expressing gratitude can be super powerful for a business. According to Randy Raggio, a marketing professor at the University of Richmond, in an article published in Fortune magazine in November 2011, “Gratitude motivates positive reciprocal behavior,” If a customer believes that a business has his best interests at heart, that customer is more inclined to develop a long-term relationship with the business. The article also mentions that gratitude is an effective tool largely because “it is a precursor to developing trust,” and trust itself is an extremely powerful driver for loyalty, no matter the type of relationship. Just the same, gratitude is only valuable when it comes across as genuine. So, as we move through this month, and towards 2016 , make it a New Year resolutions to add daily gratitude into your life, and let us know what happens. This entry was posted in Blog and tagged appreciation, business, clients, gratitude, priorities, thankful on November 15, 2015 by Assistant Match.